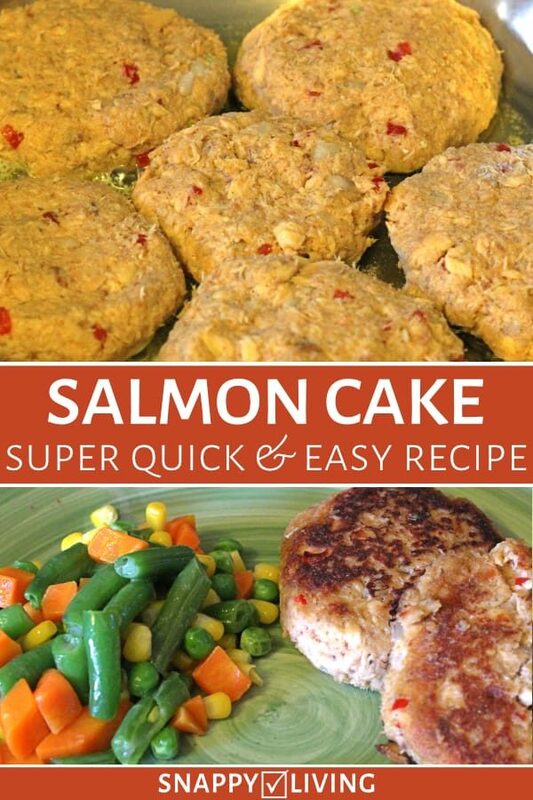 This is a really simple salmon cake recipe that my family makes. It’s very quick to make, maybe 15 minutes prep time and 10 minutes cook time. While the salmon cakes are cooking, you can cook some quick side dishes, and you’ve got a quick, easy meal that’s filling. You could dress these up anyway you like. We’ve always eaten them with applesauce, which goes surprisingly well with salmon, but you could try tartar sauce or a spicy mayonnaise recipe. These cakes could also work as salmon burgers – just put them on a bun with your choice of condiments. 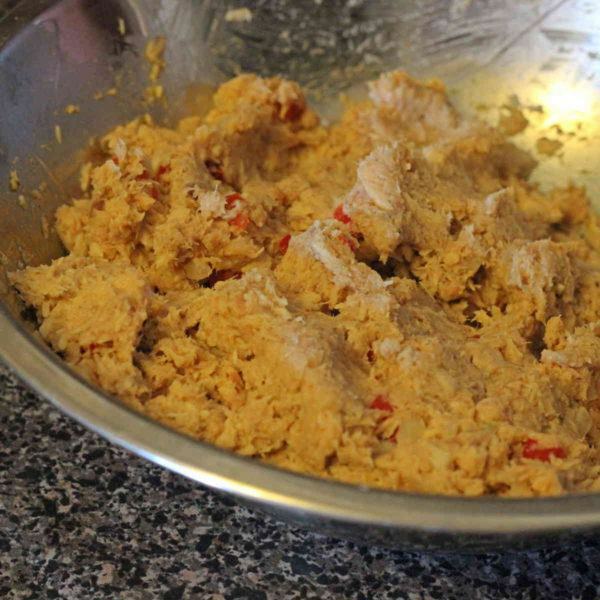 These are all the ingredients – canned pink salmon, breadcrumbs, one egg, bell pepper, and onion. Oh, and 2 tablespoons of butter. I told you this was simple! You can use green bell peppers if you prefer that flavor. I don’t drain the can of salmon first. It’s just water, and I find the added moisture helps the recipe. Now, you can eat everything in that can, which may include some skin and (extremely softened) bones. They’re actually a great source of calcium, Omega 3 fats and other nutrients, and they’re soft like the rest of the meat. Not at all weird and crunchy like you might imagine. 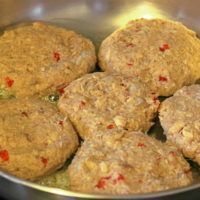 But if you’re really grossed out at the thought, you can remove them if you want – this salmon cake recipe will work just fine without them. Then you dump everything into a mixing bowl, except the butter. You can stir it with a fork or spoon, but it works better if you knead it with your hands, like a meatloaf. In the end you get something that looks like this, and then you form 6 patties out of it. Then you flip them and cook them 5 minutes on the other side. Or thereabouts – it can differ slightly depending on your stove, but not by more than a minute or so. For a really quick meal, boil some mixed veggies in a bag and serve with applesauce with a little cinnamon sprinkled over it. We actually dip the salmon cakes in the applesauce, but if you don’t like that you can always go with tartar sauce or something else. You may also want to squeeze some lemon juice over the cakes – this is something I’ll do if I have a lemon handy, but I don’t miss it the rest of the time. It’s good both ways. You can also serve these as burgers. 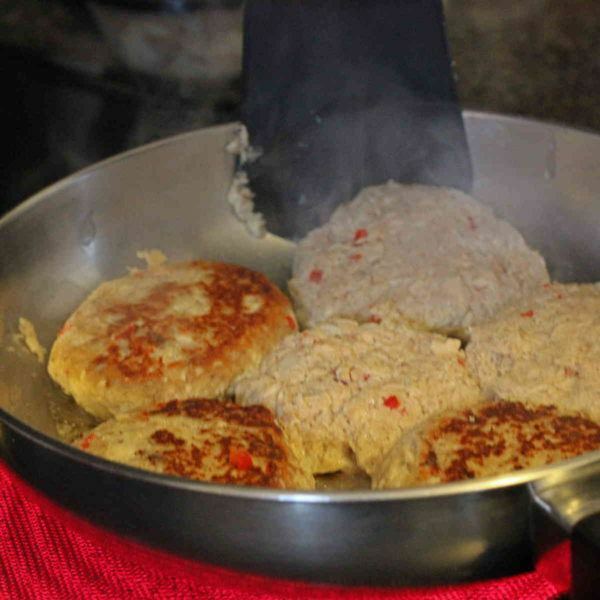 Salmon cakes are a great substitute for beef patties. And compound butters can add so much to your salmon burger. 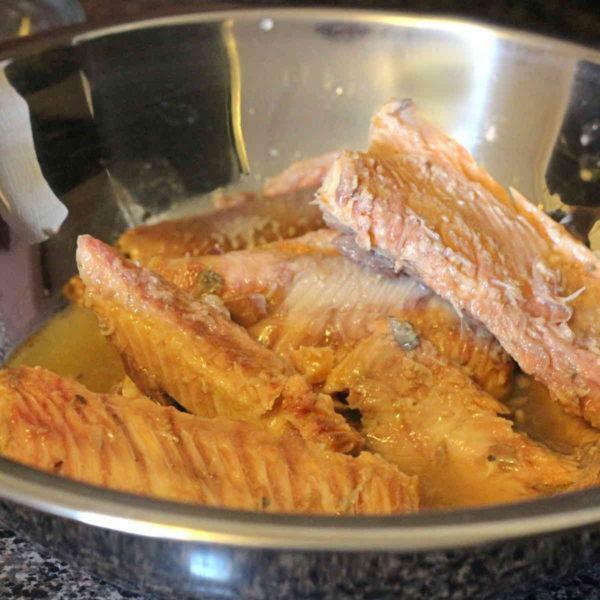 You may also want to check out my Red Sockeye Salmon Salad Recipe. 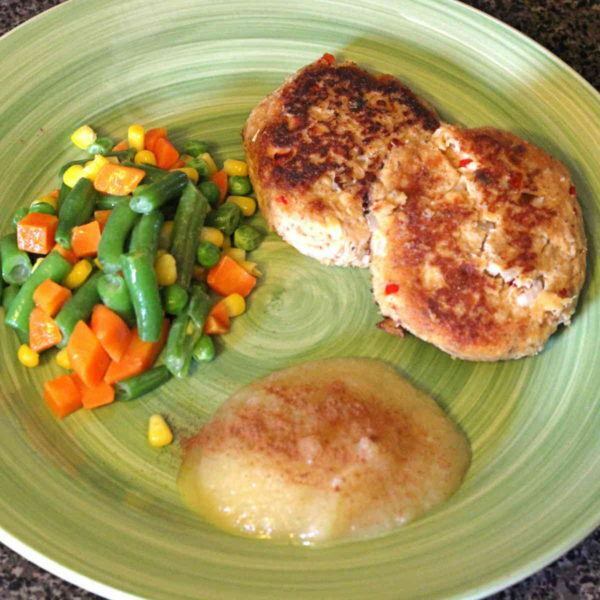 These salmon cakes make a nutritious meal that's affordable and doesn't take long to cook. With eggs, peppers, breadcrumbs and more, these are filling enough to eat by themselves or on a burger. 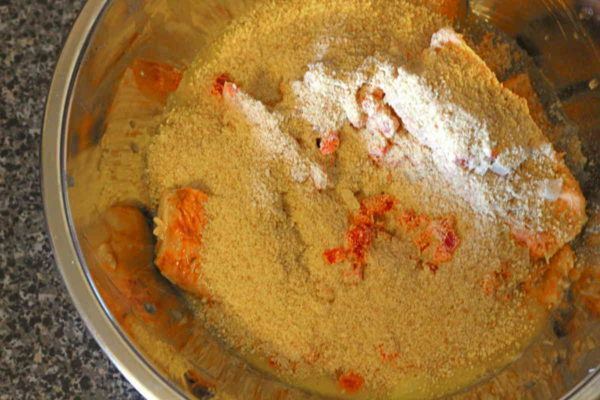 Pour the can of salmon into a mixing bowl. If preferred, remove skin and bones, but it's all edible (you won't even notice it), and the skin and bones have lots of nutritional value. Pour in the egg, onion, pepper and breadcrumbs. Knead it all together with your hands, like a meatloaf. Divide it into 6 portions and form patties. Put the butter into a skillet on medium heat and spread it around the bottom as it melts. Once it's melted, add the patties. Cook them them for about 5 minutes (or until brown) and flip to the other side for equal time.